So I’m in NYC, and I’m keeping my eyes peeled for any of our TV faves that may be in town for the netwwork upfronts. I got to my fab stalking location, and within 2 minutes of sitting down I saw my first who’s who in TV. Keep checking back for updates, and let’s hope I see a few more noteworthy peeps. 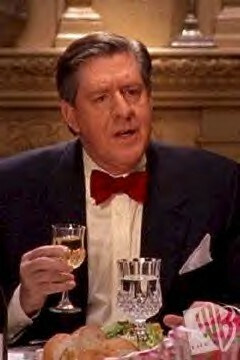 First sighting: Edward Herrmann (Richard Gilmore) of Gilmore Girls. Richards is sporting today’s hottest fashions. Ha ha. Actually he’s wearing jeans, a nice brown jacket and abaseball cap. He walked right by me, and I almost smiled directly at him. I’m going to try my best not to dork out too much. I love Richard Gilmore, but I’m holding out other CW newbies. Cough*Jason Dohring*Cough. UPDATE: OMG OMG OMG!!! Just ran into Veronica Mars herself, Kristen Bell!!! I was coming in the door as she was exiting. I was a little taken back and couldn’t really manage to say anything other than “Congratulations Kristen” She said a very sweet thank you. And boys, she looked HOT in some black leggings. That girl has to have the best skin in all of Hollywood. Ok, that’s two CWers..where is JD?! UPDATE:Today is a GOOD day…Scott Patterson (Luke) from Gilmore Girls is here too. Oh, and in walks Jared Padalecki (Supernatural). That guy is hot. I swear I am not making this up!! Damn…this is so much fun. UPDATE: I just spied my first Logan of the day!!! Not Echolls, but the other Logan…Logan Huntzberger. Matt Czuchry!! I can’t keep up with all the pics because my computer is a bit slow right now. UPDATE: It’s a Gilmore Girls kinda day. Christopher (David Sutcliffe) just walked in. Luke and Christopher…together. Uh oh. Should I tell Luke about Chris and Lorelai?! UPDATE: Laides and gentleman….a round of applause for Rory Gilmore!! Yes, Alexis Bledel is in the building, but sadly Milo is not with her. This is so dumb, but why am I so surprised that all these people are just walking in buy themselves…no entourage. Not that I expected Rory to have a posse, but it’s just so weird to see her by herself. God, Jason Dohring…where are you?! Veronica Mars S3 Sneak Peek – WATCH!! how dare you scoop me scooping you! Who’s Zoomin’ Who here? I considered breaking out the camera phone, but i feel a little awkward. And i can’t go up and take their photos because I will probably get kicked out of where I am. i knew at that moment i would not be prepared if we had seen Lauren Graham..